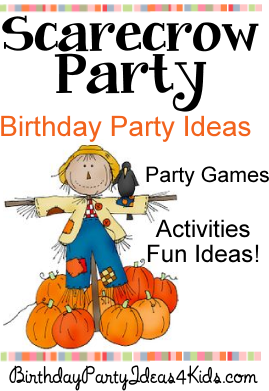 A Scarecrow birthday party theme is perfect for a Fall / Autumn birthday party! Choose your favorite scarecrow themed games and activities for your party ... mix and match what works best for your Fall themed party! Give each player two black balloons. Have the players try to keep both balloons in the air for 1 minute. To make this even more difficult, have each player use only one hand to keep the balloons in the air. Set up scarecrows and assign them point values – 10, 25, 50 points making the higher point scarecrow the hardest. One at a time players try and throw a hula hoop over the scarecrows. Add up the score for each player and the one with the highest points at the end of 3 rounds wins. Teams try to fill their container with corn the fastest. Divide players into teams. Each team should have a large bowl filled with corn at their starting point and a small paper or plastic cup. At the other end of the playing field set up two containers that are equal in size such as empty gallon milk containers (the small opening of the milk jugs make the relay more challenging and easier to determine who wins at the end of the game). One at a time players take their teams plastic cup, fill it with corn and then run and dump it into their container. Then they run back to the start and hands off the cup to the next team member. The first team that fills their container to the top wins! Give each player two bowls and a pair of chopsticks. Fill one of each players bowls with 25 candy corns. On “go” all the players take their chopsticks and try to transfer their candy corn from one bowl to the other using only their chopsticks. Fill one of the 2 liter bottles with the candies – about 1/3 of the way full. Place the other 2 liter bottle so that the 2 bottles openings are together and tape them together. Use a stop watch or timer and see if a player can transfer all the candy from one bottle to the other in 1 minute. Gather two sets of large old clothes including overalls or jeans, flannel shirts, straw hats, boots, gloves, sunglasses, etc. and place them in two separate piles a good distance from where the teams will start. Divide party guests into 2 teams. The first person from each team runs across to the pile of their teams scarecrow clothes, puts everything on, runs back to tag their team - then back again to the pile and take off the items. They then run and tag the next team member in line and that person continues the relay until everyone takes a turn. First team to finish wins! Give each player a dish containing candy corn. Set a timer to 1 minute and see how many pieces of candy corn they can stand upright before time is called. Fall Theme Minute to Win It Games are a great idea for Fall parties! Fill a clear plastic container with candy corn. While you are filling the container count the candy and write down the total number in the jar. Put the lid on the container and decorate with hay and a pretty orange bow. Set up the container on a decorated table near the entrance to the party with paper and pencils. While guests are arriving to the party ask them to guess how many pieces of candy corn are in the jar. Provide pencils and paper so they can write down their name and guess. At the end of the party read the guesses and see who is the closest to the number in the jar. Winner takes the jar home! Decorate with large and small scarecrows, orange, yellow and white balloons, hay bales, fall leaves, corn stalks and mums. Pumpkins of all sizes on the mantle and party tables with hay or corn stalks around them. Set up a cornfield by taping shades of green crepe paper hanging down from the ceiling of one of the walls in the party area. Place a few black crows around the party area. Place dried corn, pumpkins or dried leaves on candlestick holders, in large glass vases, stacked on top of each other all around the party area. Wooden crates or hay bales can be used to create height in arrangements. Decorate orange t-shirts with scarecrow or candy corn designs with fabric paint. Decorate orange pillow cases with fabric paint or fabric markers.